President Donald Trump weighed in again Tuesday on the controversy surrounding antisemitic remarks by Rep. Ilhan Omar (D-MN), who apologized Monday at the behest of Democratic leaders but kept her committee posts. Trump told a Cabinet meeting open to reporters: “I think [Omar] should either resign from Congress or she should certainly resign from the House Foreign Affairs Committee.” He also cast doubt on the sincerity of her apology. Anti-Semitism has no place in the United States Congress. And Congressman Omar, it’s terrible what she said and I think she should either resign from Congress or she should certainly resign from the House Foreign Affairs Committee. What she said is so deep-seeded in her heart that her lame apology, that’s what it was, it was lame and she didn’t mean a word of it, was just not appropriate. I think she should resign from Congress frankly, but at a minimum she shouldn’t be on committees, certainly that committee. 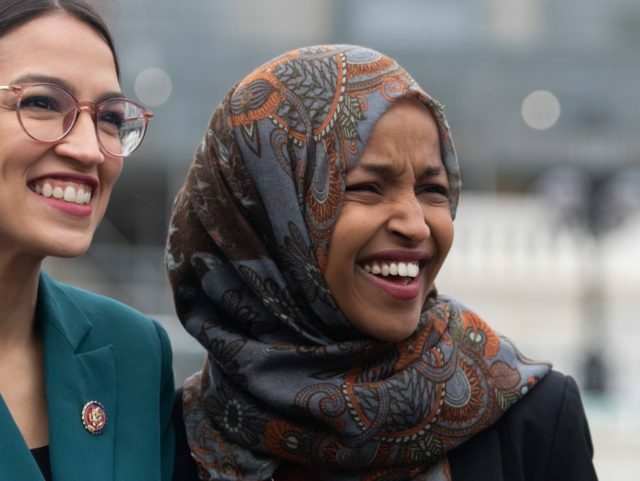 Omar apologized but vowed to continue criticizing the American Israel Public Affairs Committee (AIPAC), the pro-Israel lobbying organization that she falsely accused of paying members of Congress to support Israel. Omar’s offending tweets — from this and another occasion — remain live. Republicans stripped Rep. Steve King (R-IA) of his committee seats last month after he appeared to support white supremacy and white nationalism in a New York Times interview, though he said his words were taken out of context. Omar supports the “boycott, divestment, sanctions” (BDS) movement against Israel, which many critics consider antisemitic because it singles out Israel. This article has been updated to include the president’s full remarks.